It's from Switzerland. I have never seen it for sale in the USA. 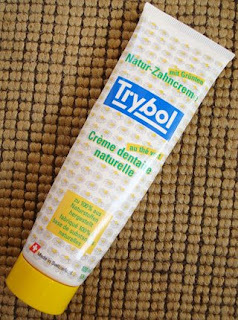 This particular flavor, "Natur-Zahncreme mit Gruntee" or "Natural toothpaste made with green tea" is my favorite of all toothpastes. It has hints of anise. On the back, the ingredients are in German, French and Italian - in that order. That's in the order of percentages of Swiss speakers. No Romanisch, which is the fourth (and smallest) official language of Switzerland. I'd wager that more people speak Turkish in Switzerland than Romanisch.